For those in Hong Kong’s trade finance sector, Duncan Wong is Mr Blockchain. The cryptographer was one of the drivers of the Hong Kong Monetary Authority (HKMA)’s early dalliances with distributed ledger technology. In his former role at the Hong Kong Applied Science and Technology Research Institute (Astri), he helped pen the HKMA’s 2016 whitepaper on blockchain, which outlined how the technology could be used in trade finance. Wong also helped the HKMA execute three proof of concepts (POCs) with five banks, exploring blockchain’s viability in trade. It is no surprise, then, that he was involved in the highest profile development in blockchain for trade finance to date. Wong’s company CryptoBLK was the technology partner for HSBC as it completed its first live trade finance transaction on blockchain. The news was announced this week, but has been months in development. Wong gave GTR an insight into how the transaction unfolded, and a preview of what’s in the project pipeline. A former professor at the Chinese University of Hong Kong, Wong left Astri after becoming frustrated at the bottleneck in blockchain development: the industry was awash with pilots, but nothing was moving into the production phase. Although it was widely reported that HSBC’s transaction with ING and Cargill was the first live trade finance transaction on blockchain, it was not. Commonwealth Bank of Australia and Wells Fargo settled a cotton export on blockchain in 2016. In the same year, Barclays and Wave closed another transaction, although that only involved a single bank. None of these projects, however, moved beyond the POC stage, a situation which frustrated technologists. “I thought it was time to commit to set up a company, to bring something into production,” Wong says. CryptoBLK was founded in June 2017 and onboarded by HSBC in September (around the time GTR reported on another early project the company undertook, with digital trade finance provider Novamondo), as the bank looked to accelerate the execution of a letter of credit on blockchain. HSBC was among 12 that had completed two POCs on R3’s Corda platform around sight letters of credit, but was keen to speed things up and did not have the technical team in-house to bring a solution to production. Wong’s team was given access to the POC data and codes and spent a month with HSBC’s innovation team studying the workflow. The initial work had been done on an early version of Corda, m11. With more recent versions of the technology available, a decision was made to start development from scratch, building on Corda v1, taking reference from the POC trials. CryptoBLK had 10 developers working on this project, and it took almost three months to build a solution, by which point Corda v2 had been released, and so the platform was upgraded. HSBC, meanwhile, was engaging with other R3 member banks and corporations, looking for partners for the initiative – it was at this point that ING became involved. The run-up to the live transaction, which happened in 24 hours in the first week of May, was spent testing: countless workshops and overnight test runs occurred, while Cargill was introduced as the client just weeks before the live launch was due to take place. The launch saw a transaction executed from letter of credit to the surrender of title, on the HSBC-modified Corda technology. It saw a cargo of soybeans exported from Argentina to Malaysia – a deal which HSBC’s head of innovation, Vivek Ramachandran, describes as “an inflection point for how trade is conducted”. Initially, the plan was to also execute the bill of lading on blockchain. However, they had not finished integrating the blockchain solution with the systems of the electronic bill of lading technology provider. The next phase is likely to take three to four months, and will see the transaction expanded to include the bill of lading. Development is ongoing with software providers in this space, while HSBC is also in discussion with other banks and service providers (including shipping companies, carriers and trade finance software companies) to include them in another live transaction. “At this moment it’s not about what new features we need on the blockchain system, but we actually need more players. We need for them to experience how significant it is, the advantage of the blockchain platform,” Wong says. This transaction was concluded in 24 hours, as opposed to the usual settling time which can take up to 10 days. Some of the main issues in development have been around legacy systems. Banks typically have a range of old computing systems, with some dating back to the 1980s. Integrating new technology with these can be complex and time-consuming. This also speaks to the challenge of industry-wide adoption: each bank may be operating vastly different legacy systems, and so the challenge multiplies. 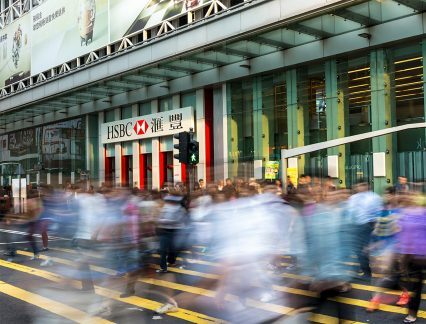 HSBC will continue to develop using Corda, due to the ease of segregating data compared to developing on Hyperledger Fabric or Ethereum. Whether the bank will continue to develop independently of the R3 consortium is unclear: R3 is set to release an enterprise test net of Corda in the coming months, which will likely accelerate the technology’s development in other areas of the industry. Other consortia are also expected to start announcing live transactions imminently, as the forward trajectory for blockchain in trade finance gains impetus.